Welcome to our latest color of MDPC-X Cable Sleeving, as always 100% unique on this planet: Lambo-Greeny! 100% made in Germany, 100% beautiful and spot-on. Of course we added our legendary fluorescent magic, which you will see under UV-A Blacklight. And we included our highest quality UV-stabilizers as in every MDPC Cable Sleeving product, so you can use it outdoors without any long term color or material degradation. We wanted to create something lighter as an addition to our MDPC Toxic-Green - not just as an alternative. Lambo-Greeny and Toxic-Green color shades can work extremely well in combination for a dynamic design. Of course it is also made for every high contrast combination i.e. with MDPC Black, MDPC Shade-19, MDPC Titanium, MDPC Grand-Bleu or MDPC Ranger-Green. Be creative and get into the dynamics of color combinations. 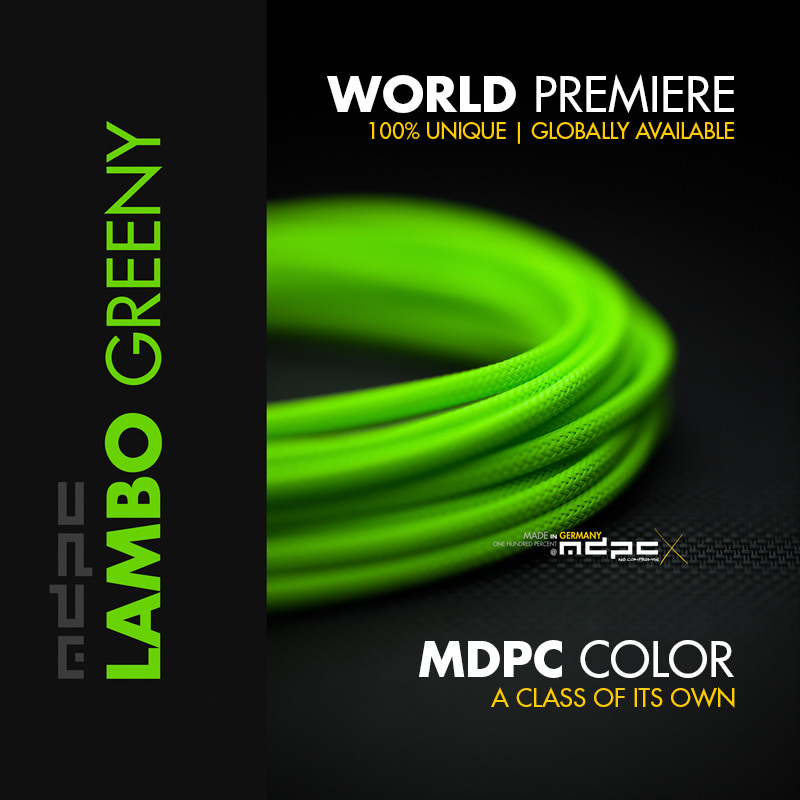 Get the new Lambo-Greeny cable sleeving by MDPC-X now! You can order Lambo-Greeny directly from us and of course you can also get MDPC-X Cable Sleeving products in even smaller quantities and directly in your continent / country through our global MDPC-X Stores. Lambo-Greeny is available as SMALL cable sleeving and as MEDIUM cable sleeves.